The University of Saint Louis (USL) Robotics teams were recently recognized by the Provincial Board of Cagayan during its 131st Regular Session at the Provincial Capitol, Tuguegarao City on Feb. 27, 2019. The award came after the groups won awards in the Science, Technology, Engineering, Arts, Mathematics (STEAM) International Challenge 2018 held at Huaqiang Vocational Technical School in Shenzhen, China on Nov. 25. Team Charlie (Leon Joy Achanzar, Claro Claveria II, and Malcolm Julian Co) was commended for placing first in the VEX IQ Middle Teamwork Challenge and for receiving a distinction award in the VEX IQ Middle Programming Skills Challenge. Team Alpha (Juliana Jessica Dalupang, Sean Kyro Patino, and Jameson Uy) was commended for landing second in the VEX IQ Middle Programming Skills Challenge. Team Bravo (Daniel Ian Atilano, Klark Darwin Mabbonag, and Priam Pharaoh Pauig) was commended for their excellence award in the same challenge. The coach, Mr. Genard T. Sonido, who is an Eduspec Robotics teacher in USL, was also commended by the Sangguniang Panlalawigan. Furthermore, USL was recognized by the same body for its efforts towards excellence and distinction in robotics. 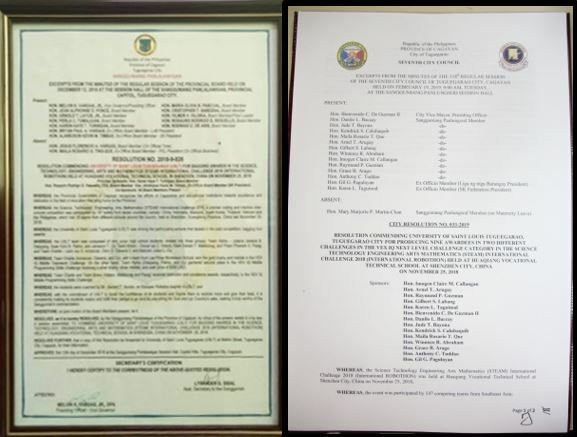 Meanwhile, the City Government of Tuguegarao gave similar commendations to the students, the coach, and the University. The awarding was held at the City Hall last March 4, 2019. Read “USL bags awards in international Robothon” at http://usl.edu.ph/usl-bags-awards-in-international-robothon/.